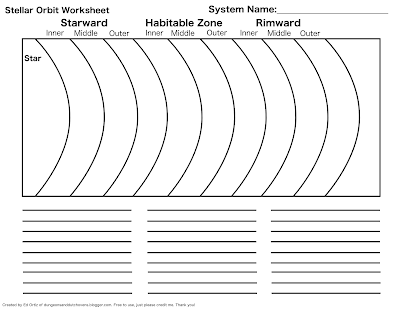 So recently I've been running an M Space/SWN mashup (don't ask how), and since it is going to eventually open up to multiple star systems, I decided that I should have a worksheet that can help me visualize the system being visited. After 40 minutes in GIMP, I created something useful. 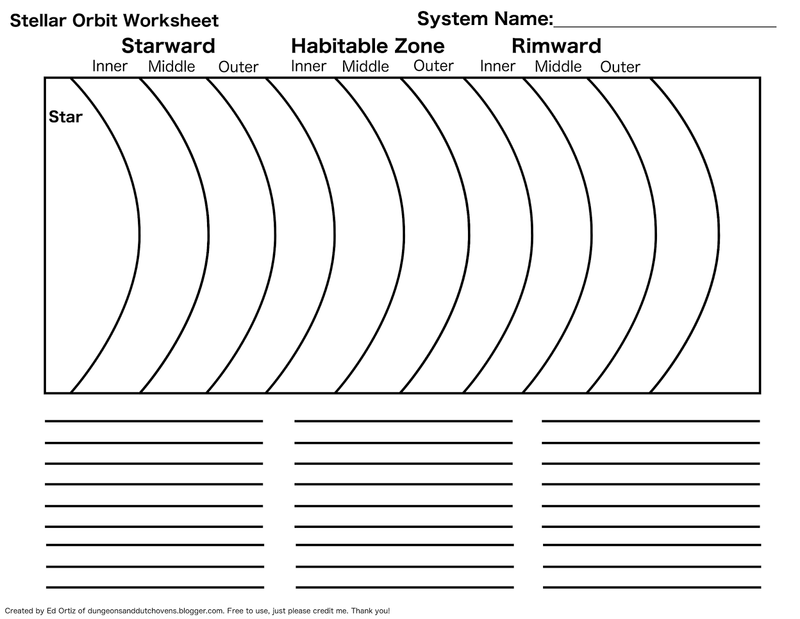 So here is the link to my Stellar System Worksheet. This is a system neutral chart I made to help GMs and players keep track of the celestial bodies in any given system that they visit. They can plot out the planets or asteroids out on the orbit bands and write in whatever information they have for it in the lines below. The orbital bands are somewhat based on Mindjammer's orbital bands, but I've found good usage in Traveller and M-Space. You have Starward (like a torch orbit with Mercury orbit), Habitable Zone (Earth, Mars), and Rimward (Gas Giants and TNO). The last area is for things you may find out in the heliopause/Oort Cloud/Kuiper Belt areas of a system if you choose that they have one. I'm currently using it in my M Space game, but I can see it used in anything from Stars Without Number, Traveller/Cepheus Engine, Mindjammer, White Star... give it a try and tell me how it works for you! Share it with your friends! Go crazy with it.